Cutting the cables and wires continues to run at the back of mind for several consumers using wired electronic devices. Common and essential gadgets such as headphones are also transforming into the wireless spectrum. While eliminating the use of cables does lower the production costs for headphone manufacturers, developing effective wireless transmitters and receptors, and integrating these components in the devices becomes a critical task. Moreover, several consumers are actively using audible media with stereophonic sound. While the demand for stereo headphones continues to remain predominant in the consumer electronics marketplace, upgrading these devices with cord-free mobility from the use of wireless technologies is instrumenting a transformation in consumer preferences. Consumers are being attracted towards wireless stereo headphones, and are including these devices into their daily lifestyles. 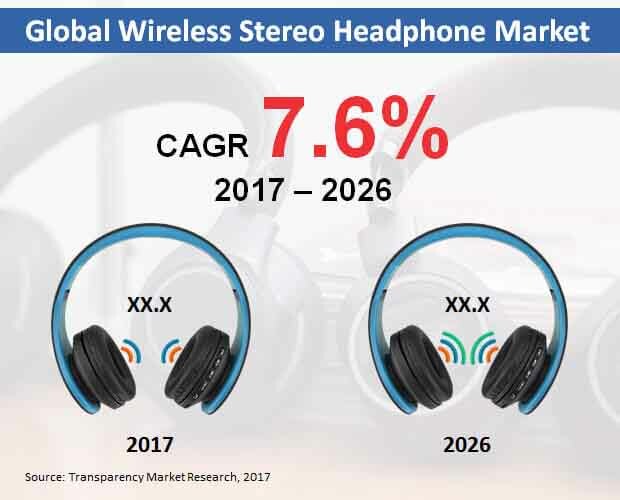 According to Transparency Market Research’s latest forecast study, the global wireless stereo headphones market is pegged to grow at an impressive pace in the foreseeable future. The report estimates that during the forecast period, 2017-2026, the global wireless stereo headphones market will expand at a CAGR of 7.6% in terms of volume. The report also projects that by the end of 2026, over 237 thousand units of wireless stereo headphones are expected be sold across the globe. Through 2026, North America is poised to register high demand for wireless stereo headphones. The report also reveals that majority of market players will be intensifying their presence in the Asia-Pacific excluding Japan (APEJ) region. User operating systems have an influential role in the wireless stereo headphone manufacturing landscape. A greater penetration of Android over iOS has a resonating effecting on the sales of wireless stereo headphone developed for these two user operating systems. iOS wireless stereo headphones are relatively high in cost, have limited multi-usability scope, and can translate high profit margins for manufacturers. On the other hand, wireless stereo headphones developed for Android operators are outselling their iOS counterparts in large volumes. In addition to being cheap, these headphones cater to a vast user base of Android devices, creating an unending demand influx in the global wireless stereo headphone market. The report estimates that by the end of 2026, nearly 80% of wireless stereo headphones sold in the global market will be developed for Android operating systems. The report also estimates that majority of wireless stereo headphones being manufactured in the global market will be distributed through multi-brand stores. By 2026-end, around 95 thousand units of wireless stereo headphones are expected to be distributed globally through multi-brand stores. Furthermore, the report also reveals that online distribution of wireless stereo headphone will gain traction, registering the highest volume CAGR of 8.6% over the forecast period. Leading companies in the global wireless stereo headphone production landscape have effectively incorporated the use of popular wireless technologies such as Wireless-Fidelity (Wi-Fi) and Bluetooth. In a few years down the line, new technologies such as cloud connectivity are expected to intervene the development of wireless stereo headphones. Companies namely, Sonova Holding AG, Sivantos Pte. Ltd., MED-EL, Cochlear, Beltone, Persona, Miracle Hearing Aid Clinic, Siemens Healthcare, Shenzhen Sunsky Technology, Union Hearing Aid Centre, Starkey Hearing Aids, GN ReSound, Eartone, William Demant Holding A/S, Medtechnica Orthophone, Widex A/S, and GN Store Nord A/S are expected to be at the forefront of global wireless stereo headphones manufacturing landscape. Maintaining a high quality production and tapping to the high-spending consumer community will be among the key priorities of these companies. Through 2026, premiumization will be emerge as the most influential trend in the production and sales of wireless stereo headphones. Embracing the latest technology is a key trend in the consumer electronics marketplace, the prevalence of which has drawn consumers towards adopting gadgets or devices such as wireless stereo headphones. Operational advantage of wireless over wired has influenced headphone manufacturers across the globe. Moreover, rising consumer preference towards wireless mobility in the use of headphones, coupled with growing production of audible media with stereophonic sound, has collectively driven the global demand for wireless stereo headphones. Such undercurrents and several other factors encompassing the global wireless stereo headphones market have been addressed and studied in Transparency Market Research’s new report. The report has been developed to offer key insights on the future of the global wireless stereo headphones market for the forecast period, 2017-2026. Market size estimations, statistical data repurposing and analytical forecast developed in the report are directed to enable the manufacturers of wireless stereo headphones in the global landscape assess the key presumptive scenarios while planning their next steps en route for future market direction. The report comprises of a series of sections that categorically analyze the global market for wireless stereo headphones and develop information on the basis of robust research methodologies and calculative formulations. Multidisciplinary research approaches have been employed to understand the changing landscapes of the global wireless stereo headphones market. Consumer-side insights, social media research, trade analysis and statistical forecasting are some of the underscored particulars of the report. From cost structure and pricing to supply chain and raw material procurement strategies, the report has analyzed depths of doing business in the wireless stereo headphones market. A key highlight of the report includes providing segmental analysis on the global wireless stereo headphones market, across parameters such as user operating systems, distribution channels, and region. By supplying objective information on the marketing issues, product development opportunities, and untapped market penetrations, this study creates a roadmap on the evolution of global wireless stereo headphones market in terms of production, sales and regulatory compliance. This information is backed by values interpreted as market size estimations, wherein leading segments and nascent aspects of wireless stereo headphones businesses have been revealed. The report provides detailed competition assessment for offering unbiased information to the market players. Companies have been profiled on the basis of their positions in the current market scenario. Their strategic developments have been weighed to disclose their strengths and weaknesses. The overall report offers first-hand information that can influence the undertakings of key participants in the global wireless stereo headphones market. Transparency Market Research has developed this report by orchestrating multi-level research methodologies across a range of market parameters. Analysts with relevant market experience have compiled this report. Data has been procured from multiple sources which include direct interviews of market players and authentic databases. Analysis developed through these processes have been extrapolated to understand the historic data and assess the future prospects of making and selling wireless stereo headphones. The scope of this report is to provide industry standard analysis and accurate market forecast evaluations for wireless stereo headphone manufacturers seeking informative support to plan new strategies.